Yesterday, I shared some tips on how you can save money on your everyday household products, but that's not the only area in our lives that many of us tend to spend a lot. For many, the biggest money drainer can be fashion. Let's face it, we have to wear clothes and we want them to look nice...but that can cost a ton of money! 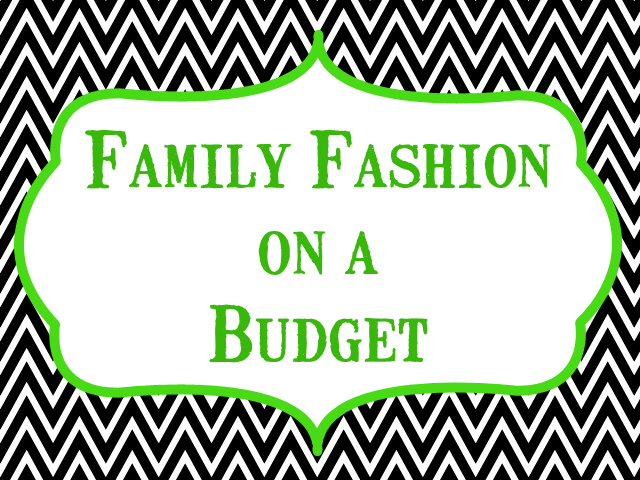 So, how do we get the fashions we love for every member of the family, but with a price tag we can afford? Today, I'm sharing a few tips and websites that I personally enjoy that can help you save money! Shop Thrift Stores. It's no secret that I am a huge thrift shopper! I love searching the racks and finding beautiful pieces for ridiculously low prices. I always try to shop sales whenever possible too, to make those thrift store prices even better! Yes, there is sometimes some searching involved, but when you hit gold, it's completely worth the time and effort. Check the Clearance Racks. I love a good clearance rack! If you're lucky, you can often find brand new, name brand clothes for a fraction of the cost! Depending on where you live and the thrift stores available to you, you might even find clearance racks allow you to get clothes even cheaper than secondhand! Set Limits. When you're shopping for deals, it can be easy to get caught up in the excitement of a good price and buy it all...which kind of defeats the purpose of shopping on a budget! So give yourself a limit before you go into the store and try to stay within it every time. Out With The Old/In With the New. Perhaps this sounds like more of an organization tip than a money saving one, but in reality it's both! When it comes to fashion, I like to change it up. So, I will do closet purges often. I sell those items in my closet I no longer wear and use that money to put towards new ones. It keeps my closet from getting TOO full, and helps to keep within my budget. This also works well for kids clothes when they're ready to move onto the next size. Schoola. This is probably my top choice for great deals on kids and womens clothing. What makes it so great? Simple. Just for signing up, you get a $20 credit- with no minimum purchase! Set up a collection for an additional $10 credit! That's $30 FREE credit, which you can use towards fantastic used clothing. AND it doesn't end there, when you share with your friends, you can earn even more free credits... you'll receive $20 for EVERY friend that joins and places an order! Awesome, right? I have personally used this site and checked out owing absolutely NOTHING for name brand clothes, and yes the clothes came. (They do offer great deals on new clothes too, but these do not work with the free credits.) Even better? Each purchase helps give money to schools across the US! Great deals, AND a great cause! This is definitely a must join!! You can sign up here. ThredUp. Much like Schoola, ThredUp gives you a $20 credit just for signing up, and allows you to earn more credit for referring friends too. You can use this credit towards fantastic clothes for yourself or your children. They also BUY your clothes from you too! Simply order a bag (no cost), send it in and earn money for the clothes. You can spend it on new items, donate to a cause or cash out via Paypal. Awesome! You can join ThredUp here. Groopdealz. Now, Groopdealz is a little bit different from the previous two. You won't get free credit for signing up, and the clothes aren't used so you won't be paying quite as little for these clothes...but there are some great deals to be found nonetheless! Groopdealz features boutique fashion and more at a fraction of the cost. Deals are ever changing and pretty fantastic if you ask me. And while you don't get that sign up credit, you CAN earn a $10 referral credit for every friend that joins and purchases! You can sign up for Groopdealz here. Are you a bargain shopper? What other tips would you add to this list? Love the websites you listed!! They are amazing!! Thred up is one of my all time favs!! I also like shopping on local mom sites :) Saves me so so much money!! Probably 80 of my clothes comes from thrift stores and freecycle and yard sales. I love it when I make a great find for super cheap!